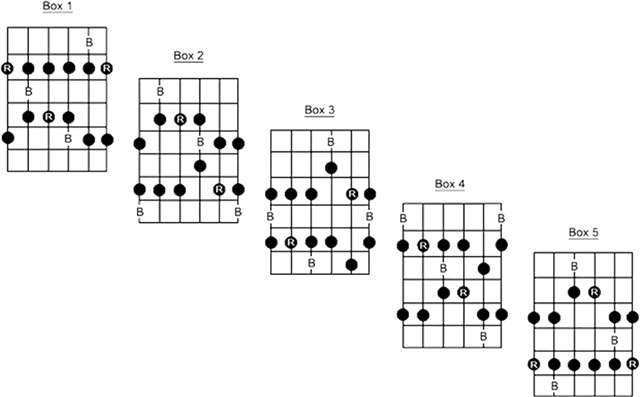 The advantage of the pentatonic scale patterns/boxes is that you can use the patterns/boxes to satisfy all three of these musical settings. This is an unbelievable stroke of luck for beginning guitarists, and you can apply a shortcut, a quick mental calculation, that allows you to instantly wail away in a major-key song, a minor-key song, or a blues song — simply by performing what is essentially a musical parlor trick. This is a great quick-fix solution to get you playing decent-sounding music virtually instantly. As you get more into the music, you may want to know why these notes are working the way they do. For now, here’s a brief explanation that’ll get you playing in the right scale: A minor pentatonic scale uses the same notes as the major pentatonic scale in the key three half-steps higher. For example, if you take the notes in the G minor pentatonic scale, you can use the same notes for a solo in Bb major, which is three half steps higher (G to Ab to A to Bb). Because the blues scale is a form of the minor scale, you can just use the pentatonic scale in that key.